Alfred May left his Pitt County home in the summer of 1862 and traveled to Wilmington, where on August 25 he enlisted in Company F (Trio Guards), Sixty-first Regiment North Carolina Troops. He served in the same unit as his older brothers Robert and Benjamin May. 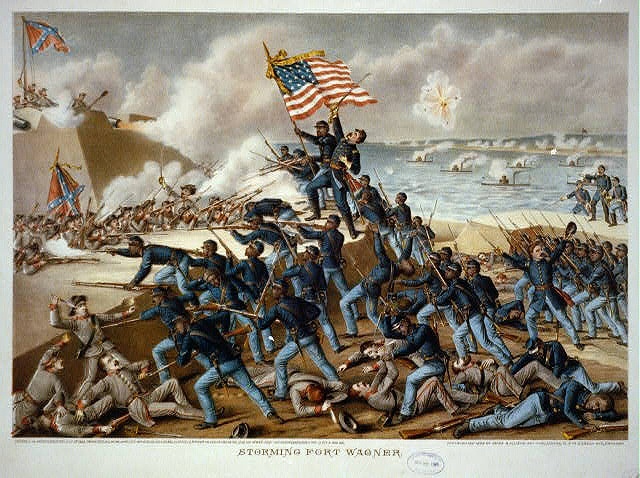 The 61st North Carolina, attached to the famous Clingman Brigade, which was composed entirely of North Carolina troops, fought in eastern North Carolina in 1862, and in 1863 it engaged in fierce combat at Battery Wagner (Fort Wagner), near Charleston, and it inflicted heavy losses on the renowned 54th Massachusetts (Colored) Infantry. On July 18, 1863, along with two brigades of white troops, the 54th assaulted Confederate Battery Wagner. Colonel Robert Gould Shaw led his men into battle by shouting: "Forward, Fifty-fourth, forward!" He mounted a parapet and urged his men forward, but was shot through the heart and he died almost instantly; his body fell into the fort. "While in the Charleston area, July 10 to September 6, 1863, the 61st North Carolina lost 6 killed, 35 wounded and 76 missing." 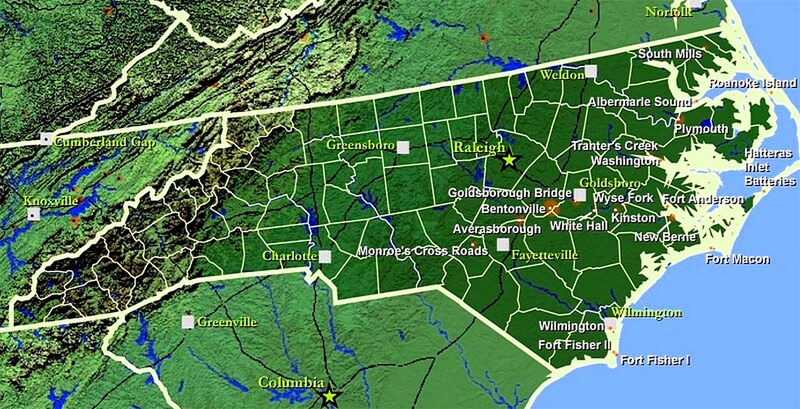 The following year, the Sixty-first North Carolina fought in several battles around Richmond. Benjamin suffered a wound to the head at Petersburg in July 1864, and Robert died in a Richmond hospital of unrecorded causes in October. The regiment participated in the last major battle of the war at Bentonville in March 1865. 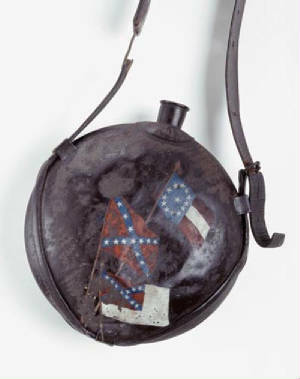 At some point in the war's final days or after the Confederate surrender, Alfred returned home and carefully put away his uniform, rifle, cartridge box, pistol, and many other items, including objects that he apparently carried home as battlefield souvenirs. The grouping of artifacts displayed here is unique. It is the largest extant collection of objects associated with a North Carolina Confederate enlisted soldier. 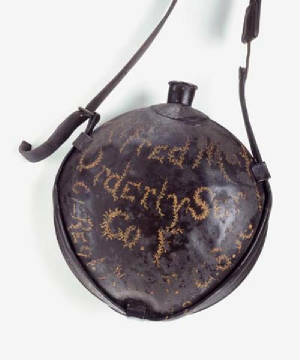 Alfred May carried this United States Army M1858 canteen during the Civil War. May was born in Pitt County and enlisted in Company F, Sixty-first Regiment North Carolina Troops in August 1862. Company F was known as the "Trio Guards" because it included soldiers from Pitt, Wilson, and Green counties. In addition to Alfred his two brothers also served in the same unit. Alfred May survived the war and returned home without surrendering and put all of his army accouterments away. His extensive collection was donated to the North Carolina Museum of History in 1996. 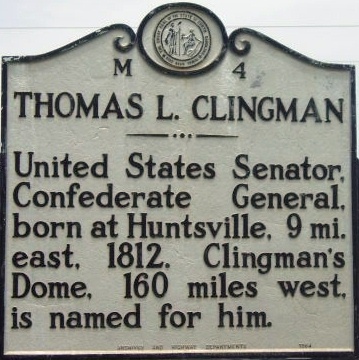 Thomas Clingman initially commanded the Twenty-fifth North Carolina Infantry Regiment before being promoted to brigade commander. The real Private W. P. Inman, portrayed by Jude Law in the movie Cold Mountain, was a Haywood County highlander who had served in Company F, Twenty-fifth North Carolina. The Fifty-fourth Massachusetts (Colored) Infantry has been honored with the Oscar winning movie, Glory , starring Denzel Washington, Morgan Freeman, Andre Braugher, and Matthew Broderick. The movie won three Oscars. Sources: North Carolina Museum of History; Official Records of the Union and Confederate Armies; Walter Clark, North Carolina Regiments, Volume III; Library of Congress; National Archives. Clingman has been called one of North Carolina’s most colorful and controversial statesmen, but his military career received little attention from his contemporaries and has been practically ignored by later historians. Like Clingman, the brigade, composed of the 8th, 31st, 51st, and 61st regiments of North Carolina Infantry, has been both praised and condemned for its performance in battle. 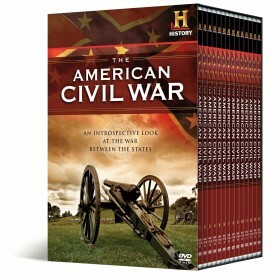 Clingman's Brigade is a treasured addition to every Civil War buff's library. Flags stir powerful emotions, and few objects evoke such a sense of duty and love for the homeland. In April 1861, the first flag of a new republic flew over North Carolina. The state had just seceded from the union, and its citizens would soon have to fight for their homes, their families, and their way of life. Each flag ismeticulously detailed and scaled to perfection. The Flags of Civil War NorthCarolina is the history of this short-lived republic (which later joined the Confederacy), told through the banners that flew over its government, cavalry, and navy. From the hand-painted flag of the Guilford Greys to the flag of the Buncombe Riflemen--made from the dresses of the ladies of Asheville--this collection is an exceptional tribute to the valiant men who bore these banners and to their ill-fated crusade for independence. About the Author: Glenn Dedmondt, a lifelong resident of the Carolinas and member of the Sons of Confederate Veterans, shares his passion for the past as a teacher of South Carolina history. Dedmondt has also been published in Confederate Veteran magazine. The author offers fascinating sketches of major and minor personalities, including the new president and state governors, Generals Lee, Beauregard, Pickett, Sherman, D.H. Hill, and Joseph E. Johnston. Rebels and abolitionists, pacifists and unionists, slaves and freed men and women, all influential, all placed in their context with clear-eyed precision. If he were wielding a needle instead of a pen, his tapestry would offer us a complete picture of a people at war.